Thirty six per cent of the crop production is lost annually due to diseases, pests and weeds under field conditions and 14% during storage. Pathogenic fungi are one among the major causes of crop loss during various stages of crop growth including postharvest. Though chemical pesticides should be the last resort in crop disease management, they are still continuing as the most dominant component of disease control. Non-judicious use of pesticides will result in residual toxicity, environmental pollution, health hazards to human and other life forms, non-specificity, resurgence and high cost. Thus, the obvious threats due to synthetic fungicides have resulted in a rethinking for the search of safer alternatives. The use of botanicals and biocontrol agents for disease management is a vital area of research in present day. Naturally occurring plants possess several antimicrobial metabolites having less human adversities and environmental impact. They have been proved as apt substitutes for synthetic pesticides. Plants have several mechanisms to combat diseases caused by fungal pathogens, mostly by preventing physical contact between plants and pathogens as well as through innate defence mechanisms. However, only 10% of the total plants species worldwide have been investigated for their pesticidal activities. Development of plant-based formulations is an important step to achieve their economical and effective use as pesticidal agents. 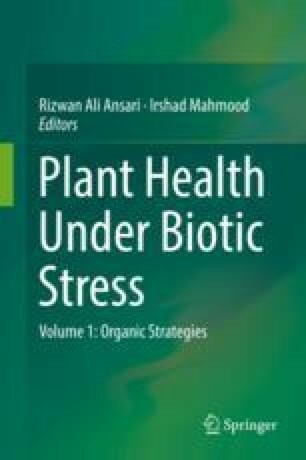 The future strategy should be to identify and select plants with antimicrobial potential, conserve them to obtain sufficient quantity and standardization of the methods for development of pesticidal formulations and utilize them for eco-friendly and safe disease management without endangering life forms and environment. Suprapta, D. N. (2016). A review of tropical plants with antifungal activities against plant fungal pathogens. Preprints. 2016100049. https://doi.org/10.20944/preprints201610.0049.v1.